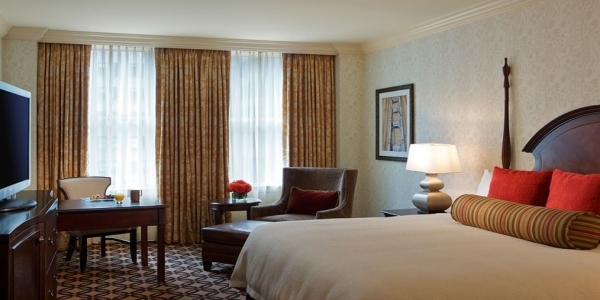 The cornerstone of Ghirardelli Square, Ghirardelli’s illustrious chocolate factory, has been reinvented as Fairmont Heritage Place, Ghirardelli Square. 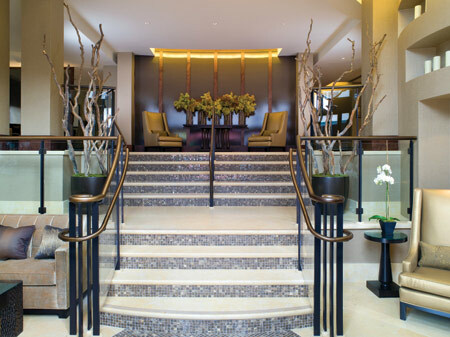 Our residential-style, all-suite San Francisco luxury hotel allows you to experience one of the city’s most precious jewels in a new and intimate way. Step into a timeless treasure, overlooking the San Francisco Bay, and allow us to turn moments into memories during your leisure stay, influential meeting or breathtaking wedding or event. Offering one, two and three bedroom luxury vacation rentals in San Francisco – complete with gourmet kitchen, living room with fireplace and dining area – Fairmont Heritage Place, Ghirardelli Square affords you all the comforts of home with the world class service of Fairmont Hotels & Resorts that today’s discerning travelers have come to expect. Fairmont Heritage Place, Ghirardelli Square boasts a beautiful Executive Boardroom (500 sq ft) with natural light and exposed brick that is ideal for meetings for up to 12 individuals. 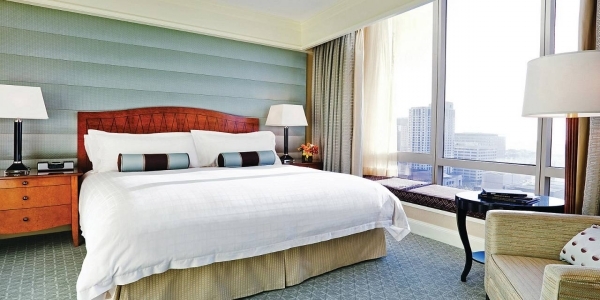 Complete with all of your audiovisual needs built-in, this iconic destination allows you to host a memorable San Francisco meeting with great ease and affordability. Our team is delighted to work with you on your food and beverage needs as well as any other special requests. Looking for a more intimate environment? Our residences afford the perfect venue for smaller meetings in the privacy of your “home away from home”. Featuring 1-, 2- or 3-bedroom residences, Fairmont Heritage Place, Ghirardelli Square can accommodate up to 20 guests for a meeting in the living room area of our 3-bedroom residences. 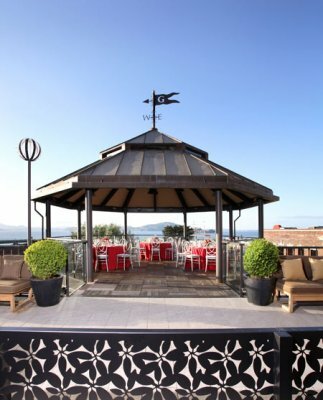 Fairmont Heritage Place, Ghirardelli Square is home to spectacular outdoor venues for your upcoming special San Francisco event. Boasting some of the most breathtaking views of the Bay, our Mustard Terrace and Carillon are popular and unique destinations for personal or corporate events. Whether it be an intimate San Francisco wedding, a launch party, a dinner reception or a holiday event, Fairmont Heritage Place, Ghirardelli Square is the ideal venue for a memorable occasion. 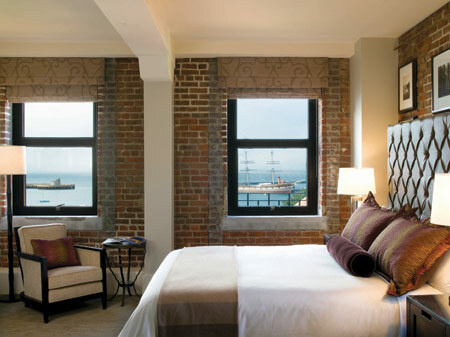 Fairmont Heritage Place, Ghirardelli Square’s luxurious and spacious accommodations in San Francisco feature one, two, and three bedroom residences that are a bold illustration of contemporary urban design in a landmark setting. 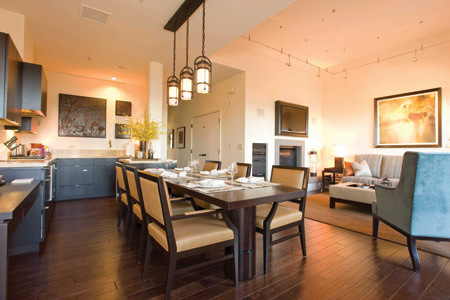 Each San Francisco residence at Fairmont Heritage Place, Ghirardelli Square features a full gourmet kitchen, living space with fireplace and large plasma screen television, and a dining area designed for interactive entertaining.The open-concept living space features dark wood floors, an open loft-like ceiling, and exposed original red brick, creating an inviting space to relax. Each residential-style accommodation within our luxury all-suite hotel features bedrooms with full private bath en suite, flat screen LCD Television, DVD/CD player, contemporary art and richly colored wall-to-wall carpeting. The en suite master bath has creamy stone tile floors and dark wood cabinets. A glass door opens into the wet-room, which features an oversized bathtub and a separate rain shower area. The living room features dark wood floors, open loft-like ceiling, exposed original brick with elegant contemporary sofa and chairs, slated hearth-framed fireplace and 42″ mounted LCD screen television. The kitchen and dining areas of our residential-style hotel in San Francisco are designed for interactive entertaining and feature elegant bronze pendant lights and stainless steel details throughout which complement the sleek wood cabinetry made of rich Wenge veneer. 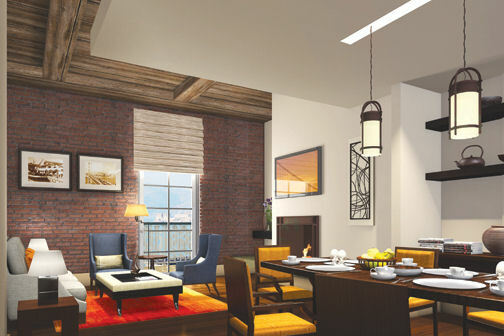 The dining area extends from the kitchen with a dark wood table accompanied by beautiful wood-framed dining chairs. The kitchen is fully equipped and contains a Sub-Zero refrigerator, Wolf appliances and built-in glass front wine refrigerator. One Bedroom Residences can accommodate up to four guests. 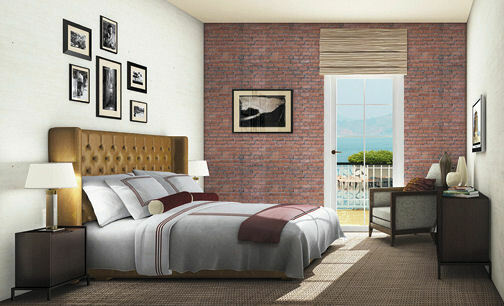 Two Bedroom Residences can accommodate up to six guests. 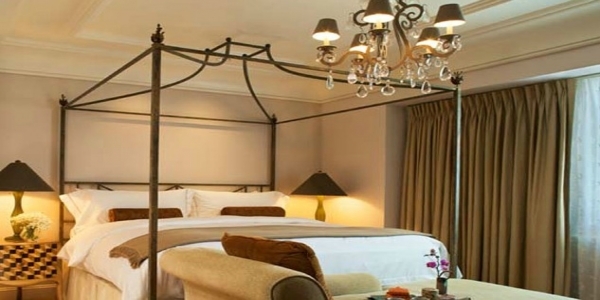 Each bedroom features its own private bathroom en suite. 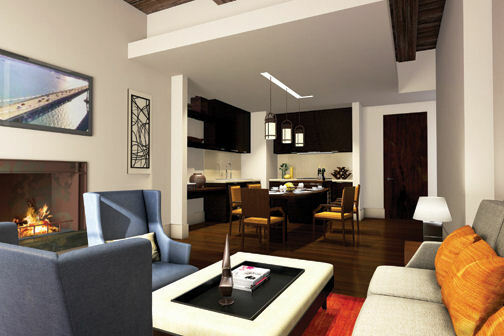 Three Bedroom Residences can accommodate up to eight guests. 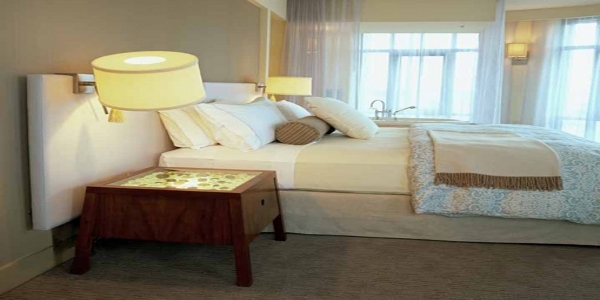 Each of the three bedrooms features its own private bathroom en suite. Ghirardelli Square’s transformation into an urban enclave of high-end retail, fine dining restaurants, wine tasting and the highly anticipated Fairmont Heritage Place, Ghirardelli Square, have finally been unveiled. Choose from fine dining Vietnamese cuisine or fabulous Seafood with an unparalleled view of the Bay. For dessert, enjoy the original Ghirardelli Ice Cream & Chocolate Shop or Kara’s Cupcakes, both San Francisco legends. For classic southern comfort food, head down to The Pub at Ghirardelli Square. Located on Beach Street, the pub serves up great BBQ and all your favourite beverages. If you’re looking for something truly unique, head over to Crown & Crumpet for the whole English Afternoon Tea Experience. You can also visit Wine Country without leaving the square by visiting Cellar360 and Wattle Creek Winery for a memorable tasting experience. For all of you nostalgic diners out there, make sure to visit Lori’s Diner, a classic 50’s-style diner serving breakfast, lunch and dinner. An American Brasserie, by renowned San Francisco Chef Gary Danko is expected to open in late 2011. Come check out all of the changes happening at the Square today during your stay at Fairmont Heritage Place, Ghirardelli Square! 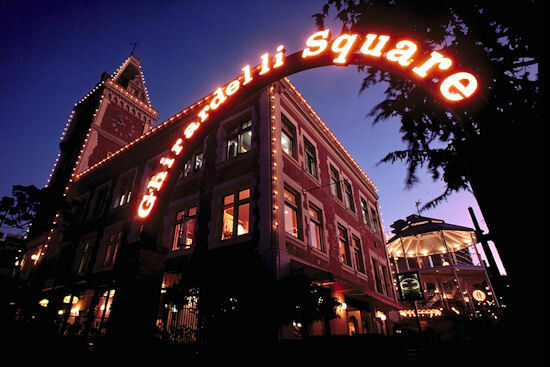 The Ghirardelli Chocolate Company began its rich history of chocolate-making at Ghirardelli Square in 1852. Don’t miss the Original Ghirardelli Ice Cream and Chocolate Manufactory, an iconic piece of San Francisco history. At the Ghirardelli Ice Cream and Chocolate Shop you can view the original chocolate manufacturing equipment, indulge in Hot Fudge Sundaes, and sample one of their famous Chocolate Squares. Cellar360 is a one-stop opportunity for San Francisco’s residents and visitors to enjoy the wine country lifestyle without having to leave the city. Cellar360 offers its guests access to a broad spectrum of premium wines, delicious wine-focused foods, personalized service from a stellar team of wine consultants, culinary education and programs, winery events and more. The Club Room, Food and Wine Education Center, Outdoor Patio and the Entire Venue offer the perfect setting for your next meeting, reception, luncheon or dinner. Come to Crown & Crumpet for the whole English Afternoon Tea Experience. After tea you can indulge in the English Aperitif bar with a fine selection of Sherries, Ports and Madeiras with other libations and of course, loads of nibbles. Kara’s Cupcakes is an artisan bakery which has set a new standard for cupcakes. They source all of their ingredients locally, emphasizing the use of organic products, and baking throughout the day to ensure the cupcakes are sold within hours, if not minutes, from being carefully baked. They are community activists and donate all uneaten cupcakes at the end of each business day to local charitable organizations here in San Francisco. Come find out why Kara’s Cupcakes was voted “Best Cupcake” in San Francisco. Located in historic Ghirardelli Square, McCormick and Kuleto’s Seafood Restaurant offers panoramic views of the San Francisco Bay, Angel Island, Alcatraz and Aquatic Park. McCormick and Kuleto’s Seafood Restaurant has a warm, classic ambiance created by a 3-tiered dining room design and a rich décor of deep mahogany woods, unique lighting fixtures, classic brass accents and expansive windows with unparalleled views.At McCormick and Kuleto’s you’ll find gracious and professional service and fabulous food in a unique and exciting setting. Ask about our private dining and catering. Your new neighborhood Bar & Grill featuring Southern Style BBQ and a full bar! Featuring favorites like pulled pork, brisket, ribs and mac & cheese. Open late everyday–serving food until 1:30am daily. $3 Bud & Bud Lights ALWAYS! For all of you nostalgic diners out there, here is a time machine to take you back to the good old days! Back to the neon lights, flashy architecture, and rock’n’roll of the fabulous 50’s! Designed to pay homage to the most American of icons: the Hamburger, French Fries, Coca-Cola, Malts and Ice Cream Sodas. Lori’s is the most classic of diners! Wattle Creek has brought Sonoma Wine Country to the city! If you can’t make it north to Wattle Creek’s Alexander Valley winery, come visit their Ghirardelli tasting room! Discover what happens when amazing winemaking and sublime terroir come together. You’ll have the opportunity to sample all of Wattle Creek’s award winning and limited release wines!